The RR.Memorial Forum was a mixed program of closed workshops, public conversations, musical performances and an exhibition. We acknowledge and pay respect to the Traditional Owners of Melbourne, the Boon Wurrung and Wurrundjeri peoples of the Kulin Nations, on whose lands we gather. Professor Annie E. Coombes with Shiraz Bayjoo, Maya Hodge and Savina Sirik at the Koorie Heritage Trust. Photo: Polly Stanton. 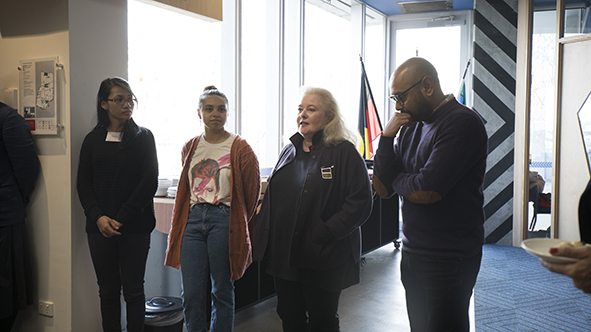 Lyndon Ormond-Parker, Marcia Langton, Brook Andrew, Nelson Abiti and Savina Sirik at the Koorie Heritage Trust. Photo: Polly Stanton. 10:30am-2:00pm Delegates gathered for a Welcome to Country with N'arweet Carolyn Briggs, Boon Wurrung senior elder, followed by a cultural walk through Melbourne. There were site visits to the Kings Domain Resting Place and meeting with Uncle Jim Berg and to the memorial public artwork Standing by Tunnerminnerwait and Maulboyheenner to meet with community organiser Joe Toscano. 10:00am-4:45pm Closed workshop with a forum overview by Brook Andrew and delegate introductions facilitated by Professor Marcia Langton and Dr Lyndon Ormond-Parker at the University of Melbourne. 5:30pm Public book launch of Remembering the Myall Creek Massacre, edited by Professors Jane Lydon and Lyndall Ryan and published by NewSouth, launched by Aunty Sue Blacklock at the Village Roadshow Theatrette State Library of Victoria Conference Centre. 6:00-8:00pm Public MUMA Boiler Room Lecture: Walking on Bones, Empowering Memory. Conversation with Brook Andrew, Marcia Langton, Lyndon Ormond-Parker, Nelson Abiti and Savina Sirik at the Village Roadshow Theatrette State Library of Victoria Conference Centre. 9:30am–4:45pm Closed workshop with delegates and invited guests about protocols for future memorials, facilitated by Dr Lyndon Ormond-Parker, Dr Fabri Blacklock and Aunty Sue Blacklock at Monash Caulfield. 5:00pm-6:00pm Public MADA Artforum: Artist Shiraz Bayjoo and musician Jessie Lloyd in conversation with Brook Andrew at Monash Art Design & Architecture Building G, Room G1.04, 900 Dandenong Rd, Caulfield East. 6:00pm-8:00pm Public opening of the exhibition Representation, Remembrance and the Memorial, curated by Brook Andrew and Jessica Neath at MADA Gallery Monash University Caulfield Campus Building D, Ground Floor, 900 Dandenong Road Caulfield East. Corina Marino, Jenny Bisset and Anne Loxley presenting the Blacktown Native Institution site to workshop participants. RMIT Design Hub, 29th June 2018. Photograph by Brook Andrew. 9:00am-6:00pm Design Charrettes, closed workshop with delegates, and invited architects, landscape architects, artists and scholars, and testing of the protocols developed in the Wednesday workshop against the three case studies. Facilitated by Carroll Go-Sam, Jock Gilbert and Christine Phillips at the RMIT Design Hub. 10:00am-2:00pm Closed workshop with delegates wrapping-up forum proceedings at the RMIT Design Hub. 11:00am optional tour of the exhibition Colony: Australia 1770–1861 and Colony: Frontier Wars. 12:30pm-6pm Public program, Confronting the Frontier Wars: International Perspectives. An afternoon of presentations, music and conversations between forum delegates and other invited speakers at the Ian Potter Centre: NGV Australia, Federation Square, Melbourne.